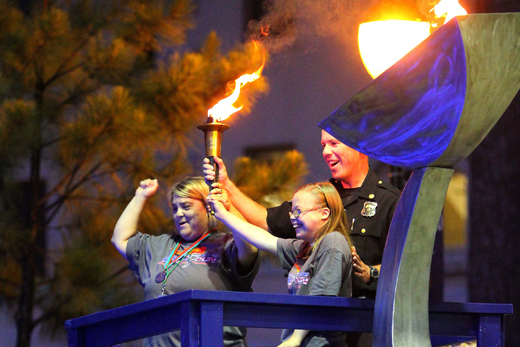 The Special Olympics State Summer Games begin with opening ceremonies Friday evening. Dozens of Emory employees will be on hand throughout the weekend to help the games run smoothly; members of the university community are also encouraged to fill the stands to cheer for athletes. Photo courtesy Special Olympics Georgia. When Special Olympics Georgia first brought its statewide summer games to Emory in 1988, Mark Kimbrough — then a young electrician working for Facilities Management — decided to volunteer his weekend to help. Kimbrough had never spent much time around people with intellectual disabilities, aside from his role as a Sunday school teacher working with a few students with special needs. But his supervisor at the time asked him to consider helping with the logistics of inviting some 3,000 athletes, coaches and sponsors to campus for the weekend. So Kimbrough volunteered, too. Today, some 27 years later, Kimbrough is still volunteering. In fact, since the Special Olympics came to Emory, he’s never missed a summer. Emory Report caught up with Kimbrough — now a Campus Services facilities supervisor — to talk about the challenges and rewards of helping the university play host to the 2015 Special Olympics (SOGA) State Summer Games, which run May 29-31. Mark Kimbrough, a Campus Services facilities supervisor, has volunteered every year since the Summer Games came to Emory in 1988. How did the Special Olympics first capture your attention? I had never heard of Special Olympics, so the first year (the games) were here I had no idea what to expect. It was just an opportunity to work. My supervisor was looking for someone interested in hooking up power and being around the entire weekend in case there were any issues. As it turned out, it was really enjoyable, really interesting. 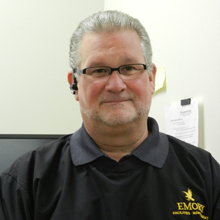 When Emory’s SOGA coordinator Tom Pruett retired, he asked me to take his place, so I stepped into the role not only as an electrician, but to help coordinate Emory’s support of the games. From a facilities perspective, what goes into the Summer Games? Believe it or not, a whole host of Emory entities help make this happen, from parking and traffic to food services, maintenance and the Emory police department. Athletes have to eat and be transported and housed; they have to get here and compete and leave. From Campus Services alone we’ll probably have 40 people working this weekend, handling everything from delivering tables and chairs and picking up waste to making sure the athletic fields and facilities are ready so everyone can enjoy the event. In some ways, we like to be invisible. If you never have to think about what we do, that means you didn’t experience a problem. Opening ceremonies are definitely electrifying. There is so much energy. For some of these athletes, this is Christmas, Thanksgiving and your birthday all rolled into one weekend — the most special event they will attend all year. When that (Special Olympics) torch comes onto McDonough Field, escorted by police cars and motorcycles with all the lights and sirens going, it’s a pretty big moment. There must be a lot of creative problem-solving in your job. Another time, a lady came to us in tears. She had to get her athlete to the starting line for a motorized wheelchair race and the wheelchair wouldn’t budge. Four of us came over to help and found that the on/off switch was broken. I bypassed the switch and the athlete was able to move to the starting line. Of course, we had to stick around and see how he did. Wouldn’t you know, he came in first and got the gold. Now you have four grown men turning away from each other, wiping their eyes and talking about how, man, the sun’s really bright today. There is so much joy. When these folks come to campus, there is so much humility. They will actually apologize for asking a question or expressing a need. It is such a grateful group of people. One year, during the Saturday night victory dance, I was talking with a captain from the National Guard. She was telling me how much her feet hurt from wearing combat boots all day long and I was saying, “Oh, tell me about it. I’ve been on my feet all day, too.” We turn around and there, out on the dance floor, is an athlete dancing on his knees. He has no feet. And I’m complaining? It’s really about what you have, not about what you think you don’t have. Opening ceremonies for the 2015 Special Olympics Georgia Summer Games will begin at 7:30 p.m. on Friday, May 29, at McDonough Field. Admission is free and the Emory community is invited to attend to cheer on athletes throughout the weekend. For an information guide and schedule, visit here.